MESA Executive Director Dr. Oscar Porter will be an expert panelist during the fourth annual U.S. News STEM Solutions conference in San Diego next week. 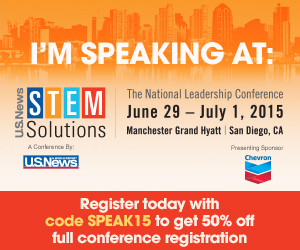 The conference will draw more than 1,500 stakeholders from all sectors of the national STEM community to San Diego to address both exciting new models in STEM education and how to remedy the shortage of qualified STEM workers in the U.S. This is the second time Porter has been selected to speak at the invite-only event. MESA in general, and Porter specifically, is regularly tapped to speak as an authority on STEM education,higher education access to disadvantage communities and filling the STEM pipeline needs of industry. Porter is also involved with various STEM education-related organizations and events around the country. He’s a member of the California Department of Education STEM task force and an American STEM Alliance board of director. He’s regularly been a speaker at the CSLNet STEM Summitt and the US. News event. Porter’s more than 30 years in higher education research coupled with MESA’s clear and successful mission of supporting educationally disadvantaged students to succeed in STEM, make MESA a clear fit as a leader in STEM education pathways, policy and best practices.